It’s no surprise people have a hard time talking about money. Most of us were not taught the specific skills of communication or financial management. When people explore their relationship with money with curiosity, things begin to shift. 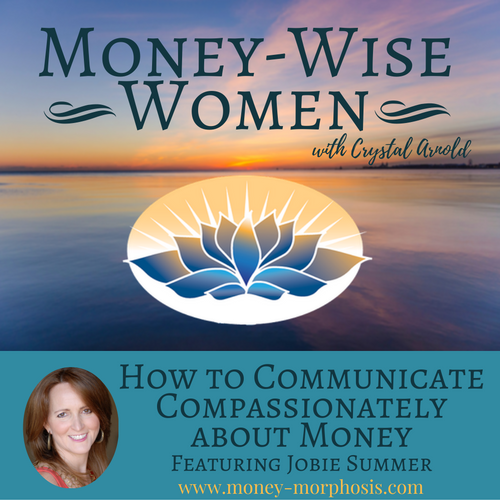 Today’s “Money-Wise Women” show is with communication expert and former certified financial planner Jobie Summer. She explains how to deepen your communication with others…and how to have more fun with money. Why are so many people struggling with money? Self-respect and self-compassion are crucial for greater prosperity. The modern extractive economy and the messages of “not enough” encourage us to consume instead of create. Success is defined by an individual’s net worth and a country’s GDP. Hierarchical power systems consolidate financial wealth in the hands of a few. In contrast, sacred economics taps into the innate genius of the individual and exalts it through mutually beneficial exchange. Listen in as Jobie shares five steps to more effective communication about money. Her real-life examples illustrate how powerful it is to identify our feelings and needs and request appropriate support. This creates an upward spiral—as we develop self-love, we’re able to open wider to receive and acknowledge. When people communicate effectively, a transformational portal for lasting change is opened. Conscious communication develops empathy, which is the antidote to the suffering of separation. Empathy enables you to understand another person through imagining yourself in the shoes of the other. When we acknowledge the feelings of another, compassion and love flavor the connection. We discuss the deep and honorable desire to be appreciated and acknowledged. You have probably felt the pain of feeling undervalued in some way. Yet when we access the power of self-compassion, there is a quality of satisfaction that can never come from outside. Listen to this edition of “Money-Wise Women” and receive a dose of inspiration and practical communication tools to implement in your life. Jobie Summer is a communication expert, a skilled speaker, author, and coach who is passionate about helping individuals, couples and teams communicate effectively. She teaches them “hands-on,” real-life communication skills so they can have deeply fulfilling relationships and make a greater impact in their work and in the world. As a former financial advisor, mediator, and practitioner of Nonviolent Communication and Compassionate Listening, Jobie has over 18 years experience in guiding clients to be empowered and establish healthy relationships, communication, and agreements. She believes that effective communication begins with self-compassion and connection. When Jobie was only 32 years old, she sold her business as a financial advisor for AIG and dedicated her work to supporting others.